Cats are really no different than humans. Ok, maybe there are a few slight differences, but we do have something in common. We both get stressed. Traveling, moving, meeting new people, loud noises, or a dirty litter box are all events that can trigger feline stress. But what if you could easily calm your stressed-out kitty? Well luckily you can, with a simple cat calming spray. In this article, I am going to review the best cat calming sprays and discuss the pros and cons of each option so you can decide which spray is the best for your anxious feline. Most calming sprays contain pheromones, chemicals that are released by an animal to communicate with others in that species. When a cat rubs its face against an object, it is marking that area with pheromones. “Pheromone marks” are the way cats label safe areas. Since cats can become stressed in unfamiliar or new situations, pheromones are a useful tool to let the cat know they are safe. Cat calming sprays contain a pheromone mixture that, when released, helps a cat feel secure. These pheromones are undetectable to humans and should only be sprayed on objects, never directly on a cat. Do You Need Calming Spray? 1.) Does your cat already exhibit signs of stress or anxiety? If you answered yes to either of these questions, you may want to try a calming spray. Although there is no strong scientific evidence to support the benefits of these sprays, they are generally deemed unharmful. They also smell nice, so it may be worth trying a spray to help your anxious cat. You should also talk to your veterinarian about these sprays to see how effective they will be for your specific cat. 1.) Budget: You will have to decide what price you are comfortable with for this product. There is quite a bit of variation on price between the products. 2.) Pheromone vs Natural: Most sprays are a pheromone formula, which mimics the chemical released by cats when they mark a safe area. However, some companies offer a “natural” alternative, made with lavender, aloe vera, or chamomile. You will have to decide which option works best for your home. 3.) Necessity: Does your cat actually need calming spray? If they are generally not anxious or there are no major upcoming events in your cat’s life, you may not need a calming spray at this time. 4.) Effectiveness: Your cat might not respond to the calming spray. Or, you may have to try more than one spray before you find the product that works best for your cat. For a quick reference of our highest reviewed calming sprays, please review the list below. I am going to look at cat calming sprays and review them so you can make an informed decision when you decide to purchase one for your anxious kitty. The Paws & Pals Calming Spray is an all-natural alternative to traditional pheromone calming sprays. This formula includes chamomile, aloe vera, and lavender to naturally relieve anxiety and stress in cats. This product can be used at home or while traveling to keep your cat calm and reduce their stress-induced urge to scratch, hide, or tremble. This is a water-based product that is safe and non-toxic. It does not contain parabens, sulfates, phosphates, or synthetics dyes or perfumes. Since this is an all-natural spray, it does not contain pheromones. Most calming sprays are pheromone-based because this is the chemical that cats use to mark safe areas. Because this product does not contain pheromones, it might not be an effective calming spray. However, there is no strong scientific evidence to support the effectiveness of any calming spray. So, if you prefer natural products, you might want this product over a pheromone-containing spray. This product can be used for both cats and dogs, so if you are a multi-pet household, this would be a useful product. This product should be sprayed on furniture, bedding, or clothing. Even though this is a non-toxic formula, you should avoid spraying it directly on your pet. Paws & Pets offers good value for money topped with a quality product. Comfort Zone is a trusted brand that offers this veterinarian-recommended cat calming spray. This product can help calm your anxious cat at home, while traveling, or on a vet visit. It should not be sprayed directly on your pet, but into the air or on a soft surface (like a couch or bedding). You can target areas where your cat frequents by spraying this directly on their favorite surfaces. You should see results within 4-weeks of use. You can spray this product once a day on your cat’s favorite surfaces. If your cat is prone to scratching, cover the entire area with the spray. You can also spray the inside of your car or your cat’s carrier 15 minutes before a trip. Comfort Zone offers a 100% satisfaction guarantee, so you can try this product at no risk. Since this product contains pheromones, it mimics the natural marking chemical that cats release. When a cat smells pheromones, they understand they are in a safe area. This can help reduce their feelings of stress or anxiety. This is a drug-free, unscented, and odorless spray. The product can help cats who are high-strung, prone to scratching, or urinate outside of their litter box. These issues might be caused by a stressor. By using a pheromone-based spray, cats will feel calmer and stop their stressed-induced behaviors. Although this product is from a well-known brand, this is the lowest quality of the three I reviewed. However, you get what you pay for. This is the cheapest option of the three calming sprays. This is a stress-reducing spray made specifically for cats. It is a non-sedating spray that works to reduce anxiety and hyperactivity in felines. It is a long-lasting spray that is safe to use around children and pets. This formula does not contain any pheromones, so it might not be as effective as a pheromone-based spray. Pheromones are the chemical signals cats use to mark an area as safe. When they smell pheromones, cats generally become less anxious. Nature’s Miracle Calming Spray is a water-based spray. The ingredients list includes herbal extracts, flower extracts, plant seed extracts, essential oils, propylene glycol, diazolidinyl urea, methylparaben, propylparaben. This product is lower priced than the others and does not appear as effective as the other sprays reviewed in this article. Never spray this directly on your cat. Choose a soft surface, like a blanket or your cat’s bed, to spritz. Consider purchasing a pheromone-based spray. Cats naturally release pheromones to mark a “safe area”, so a pheromone-based spray has a better chance at reducing stress in your cat. Talk to your veterinarian to determine if your cat’s behavior is stress-induced or caused by another factor. In addition to the sprays, many companies offer additional cat calming products. ThunderEase offers a cat calming diffuser. This product slowly releases a pheromone-based solution into the air. It covers up to 700 sq ft and is a good option for a multiple-cat home. This product has been clinically-tested and is vet-recommended. 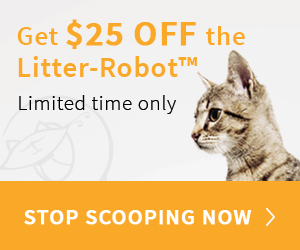 They offer a refund if you don’t notice a difference in your cat’s behavior. Homescape World makes anti-anxiety drops. This all-natural solution is placed on your cat’s food or directly in their mouth. It can reduce stress and help your cat sleep. Nutri-Vet Wellness has an anxiety-reducing paw gel. This gel is placed directly on your cat’s paws. If your cat is especially stressed, this can be used to reduce their anxiety. This product is very effective at calming cats and can also be used to reward your feline’s behavior. VetriScience Laboratories produced stress-reducing feline chews. This is an expensive product but is highly effective. You can use these daily or as needed to reduce stress-induced behaviors in your cat. A cat calming spray is a great purchase if you have an anxious or stressed-out feline. There are many different factors that can cause anxiety in cats. Moving, meeting new people or cats, a change in food are just some of their stress-triggers. And owners of a stressed-out cat know this can be very exhausting. Your stressed kitty might damage furniture by scratching or urinating outside their litter box. They could have trouble sleeping or be very high-strung. Owners with anxious cats need a solution to calm their stressed felines. In my opinion, a cat-calming spray is worth trying with your stressed-out cat. There is not enough strong scientific evidence to prove that these sprays are completely effective. However, they are generally regarded as safe, so they are worth a try. And most of the brands offer a money-back guarantee, so you can try these sprays at no risk. In general, I think pheromone-based sprays are the most effective. We’ve all seen our cat rub their face against something. This is a way for the cat to mark this as a “safe area.” Your cat has released pheromones in the process, which they will smell later. This smell will cause them to remember the “safe area” and feel relaxed. By using a pheromone-based spray, you can generate this same reaction. Your cat will smell the pheromones from the calming-spray and will feel at ease. Although the Comfort Zone Cat Calming spray is the most expensive product I reviewed, it is also the most effective. This is a pheromone-based spray that is veterinarian-recommended. It is an odorless, non-scented spray that can reduce your cat’s stress at home or while traveling. Comfort Zone offers a money-back guarantee, so you can try this at no risk. However, it is up to you to choose the right calming-spray for your cat. It is important to consider your budget before making this purchase. Also, if you prefer all-natural products, you may want to consider one of the non-pheromone options. I hope this post helps as you decide what calming product is right for your cat. If you have used a cat-calming spray, I would love to hear about your experience with it. Please feel free to leave your story in the comments below!